C4SS Research Associate Kevin Carson is a contemporary mutualist author and individualist anarchist whose written work includes Studies in Mutualist Political Economy and Organization Theory: An Individualist Anarchist Perspective. The folks at Wikileaks just released another giant cache of documents, this time on the Iraq War, surpassing their own previous record (this is 400,000 compared to 90,000 in July) for the largest leak of classified documents in history. Wow! Deja vu all over again. 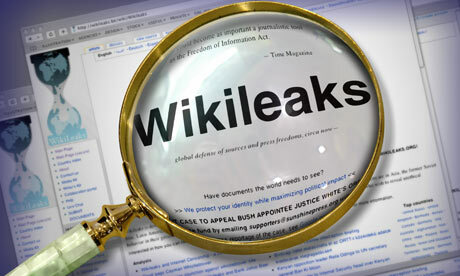 Seems like just a few weeks since the last big Wikileaks document release, when Joint Chiefs of Staff Chairman Adm. Mike Mullen was solemnly warning us that Wikileaks founder Julan Assange might have "innocent blood on his hands" ("Admiral! You're tracking innocent blood all over the briefing room!"). Well, guess what? "Defense" Secretary Robert Gates just announced that there's no evidence that any "sensitive intelligence sources and methods" had been compromised by the disclosure. You almost begin to suspect that the U.S. government would make such assertions, true or not, about any release of classified data that makes them look bad, because—well, because it makes them look bad. "He who doeth evil hateth the light," and all that. Especially amusing was the scolding Pentagon spokesman Col. Dave Lapan, USMC, gave Wikileaks for (gasp) "inducing individuals to break the law!" I haven't laughed so hard since Secretary of State George Schultz, testifying before a Congressional committee, wagged his finger at Nelson Mandela for "advocating the use of violence." It's like getting a homily on chastity from a priest who's molesting an altar boy. "The beauty of the desktop revolution is that it has radically deflated the capital outlays required for production in the information and cultural realms." Former U.S. ambassador Ryan Crocker warned that the leaked documents might have a "chilling effect," and make Iraqi political figures more hesitant to cooperate with the United States. Because you know the last thing we want, in that nifty new Iraqi "democracy" that sits like a shining city on a hill amidst the corrupt authoritarianism of the Near East, is for the Iraqi people to know what their government is doing. I mean, what kind of functioning democracy can you have if the sovereign people are able to learn what their public servants are up to and maybe even interfere? Wikileaks is a classic example of what John Robb—a specialist on networked, asymmetric warfare—calls "individual superempowerment." Individual superempowerment is "the ability of one individual to do what it took a large company or government agency to do a couple of decades ago" ("Julian Assange," Global Guerrillas, August 15). As a result, "individuals and small groups [can] take on much larger foes." ("Open Warfare and Replication," Global Guerrillas, September 20). "In short," Robb continues, "the weak are enabled to defeat the strong." It used to be that only another large organization had the resources necessary to take on a large, hierarchical organization. John Kenneth Galbraith called it "countervailing power": The power of big business was constrained by big government, big labor, and big media. The beauty of the desktop revolution is that it has radically deflated the capital outlays required for production in the information and cultural realms. In publishing, music, software, and much of journalism, individuals and small groups with at most a few thousand dollars in desktop computers, accessories and software can produce output of a quality that once required a million-dollar music studio or printing press. And you can add "countervailing power" to the list of functions that the desktop revolution has put within the reach of the superempowered individual.